Exeter sailed into the area quarter-finals of the Johnstone's Paint Trophy with a comfortable win at Hereford. Daniel Nardiello opened the scoring from the penalty spot after he was brought down by Michael Townsend. James McQuilken almost equalised when his lashed free-kick skimmed the post, but that was as close as the Bulls got. John O'Flynn turned James Dunne's cross home from six yards before Richard Duffy's powerful drive completed the procession deep into injury time. "The first goal kills you at little, but we all make mistakes and thought we played very well. "We worked hard, and I don't think the score reflected the performance. "They have listened to what we have tried to do, and we have only been trying to implement something in one day." 90:00+4:37 The referee blows for the end of the match. 90:00+2:40 The assist for the goal came from James Dunne. 90:00+2:40 GOAL - Richard Duffy:Hereford 0 - 3 Exeter Richard Duffy finds the back of the net with a goal from inside the area to the bottom left corner of the goal. Hereford 0-3 Exeter. 90:00+2:25 Corner taken short by James McQuilkin. 90:00+2:04 The ball is crossed by James McQuilkin, Sean Canham takes a shot. Save by Artur Krysiak. 90:00+1:25 Outswinging corner taken by Jake Thomson, clearance by Zac Evans. 90:00+1:07 Daniel Nardiello takes a shot. Save made by Adam Bartlett. 89:27 Chris Shephard decides to take a short corner. 88:10 The ball is crossed by Joe Colbeck, save made by Artur Krysiak. 86:41 Chris Shephard decides to take a short corner. 86:27 Centre by Joe Heath, Sam Gwynne gets a block in. 86:07 Marcus Stewart fouled by Ryan Green, the ref awards a free kick. David Noble takes the free kick. 85:44 Joe Colbeck has an effort at goal from outside the penalty area which goes wide right of the goal. 85:16 David Noble has a shot on goal from outside the area which misses right. 84:17 Free kick awarded for an unfair challenge on Chris Shephard by James McQuilkin. David Noble restarts play with the free kick. 83:01 Bertrand Cozic crosses the ball, Effort from inside the area by Daniel Nardiello misses to the right of the target. 81:34 The ball is delivered by James McQuilkin, Sean Canham produces a header from inside the area that goes over the bar. 81:21 Sam Gwynne decides to take the corner short. 79:22 James McQuilkin takes a shot. Artur Krysiak makes a save. 77:51 Sam Gwynne is caught offside. Artur Krysiak restarts play with the free kick. 76:31 Centre by Jake Thomson, clearance by Ryan Green. 75:21 Short corner taken by Sam Gwynne. 75:14 A cross is delivered by Sam Gwynne, clearance made by James Dunne. 75:06 The ball is swung over by Joe Colbeck, Rob Edwards manages to make a clearance. 73:53 Centre by Jake Thomson, clearance by Michael Townsend. 73:13 Sean Canham is flagged offside by the assistant referee. Direct free kick taken by Richard Duffy. 72:55 The assistant referee signals for offside against Daniel Nardiello. Direct free kick taken by Adam Bartlett. 72:17 Joe Colbeck has an effort at goal from just outside the box which goes wide of the right-hand upright. 71:45 Daniel Nardiello takes a shot. Save by Adam Bartlett. 70:18 Sean Canham is flagged offside by the assistant referee. Artur Krysiak restarts play with the free kick. 69:38 The ball is sent over by Jake Thomson, clearance made by Ryan Valentine. 68:25 Substitution Sam Gwynne replaces Dominik Werling. 68:12 The ball is delivered by Jake Thomson. 67:33 Daniel Nardiello is ruled offside. Michael Townsend takes the free kick. 67:01 Shot from long range by Dominik Werling goes wide of the left-hand post. 66:32 Chris Shephard has an effort at goal from outside the area missing to the wide left of the goal. 65:32 The ball is crossed by Dominik Werling, Sean Canham takes a shot. Save by Artur Krysiak. 64:19 Inswinging corner taken by Chris Shephard from the right by-line, fantastic save by Adam Bartlett. 63:39 James Dunne sends in a cross, Daniel Nardiello has an effort at goal from close in which goes wide left of the target. 63:05 A cross is delivered by Joe Colbeck, comfortable save by Artur Krysiak. 62:50 Dominik Werling produces a cross. 62:06 The ball is sent over by Dominik Werling, blocked by Jake Thomson. 61:43 Sean Canham takes a shot. Rob Edwards gets a block in. 61:29 The ball is sent over by Joe Colbeck, clearance made by Rob Edwards. 60:13 The ball is crossed by James McQuilkin, save made by Artur Krysiak. 59:20 Chris Shephard sends in a cross, Ryan Valentine manages to make a clearance. 59:09 Daniel Nardiello takes a shot. Blocked by Michael Townsend. 57:03 Substitution Chris Shephard is brought on as a substitute for John O'Flynn. 57:03 Substitution Marcus Stewart joins the action as a substitute, replacing Troy Archibald-Henville. 56:11 Centre by Dominik Werling, Rob Edwards manages to make a clearance. 55:39 Outswinging corner taken from the left by-line by Joe Heath, James McQuilkin makes a clearance. 54:50 Substitution Zac Evans comes on in place of Richard Rose. 54:50 Substitution Guillem Bauza leaves the field to be replaced by Kenny Lunt. 54:35 Bertrand Cozic produces a right-footed shot from outside the penalty box and misses wide left of the target. 52:35 Assist on the goal came from James Dunne. 52:35 GOAL - John O'Flynn:Hereford 0 - 2 Exeter John O'Flynn finds the net with a goal from inside the six-yard box low into the middle of the goal. 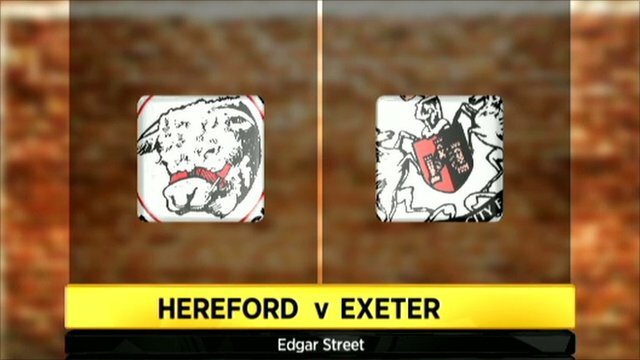 Hereford 0-2 Exeter. 51:36 Substitution Rob Edwards is brought on as a substitute for Billy Jones. 48:57 Corner taken by James McQuilkin, save by Artur Krysiak. 48:52 Joe Colbeck crosses the ball, Richard Duffy manages to make a clearance. 48:01 Unfair challenge on James McQuilkin by Daniel Nardiello results in a free kick. Direct free kick taken by Adam Bartlett. 47:16 Shot from outside the area by Ryan Green misses to the left of the goal. 45:27 The referee blows for offside. Troy Archibald-Henville restarts play with the free kick. 45:00+1:24 The half-time whistle blows. 45:00+0:50 Sean Canham is flagged offside by the assistant referee. Artur Krysiak takes the direct free kick. 45:00+0:09 Shot from outside the box by David Noble misses to the left of the target. 44:56 The ball is sent over by Joe Heath, Michael Townsend manages to make a clearance. 41:53 The ball is delivered by Joe Heath, Ryan Green gets a block in. 41:06 The ball is swung over by Richard Rose, clearance made by Troy Archibald-Henville. 40:13 James McQuilkin produces a right-footed shot from just outside the box that goes wide right of the goal. 39:43 Corner taken left-footed by Dominik Werling, The ball is swung over by Joe Colbeck, clearance by Jake Thomson. 39:38 Guillem Bauza sends in a cross, Billy Jones gets a block in. 38:46 Centre by Joe Heath, Tony James manages to make a clearance. 37:00 Daniel Nardiello is flagged offside by the assistant referee. Adam Bartlett restarts play with the free kick. 35:23 Free kick awarded for an unfair challenge on Troy Archibald-Henville by Sean Canham. Billy Jones takes the free kick. 34:06 Joe Colbeck takes a shot. Bertrand Cozic gets a block in. 33:29 Bertrand Cozic produces a cross, save made by Adam Bartlett. 32:32 Foul by Guillem Bauza on Richard Duffy, free kick awarded. David Noble takes the free kick. 31:51 John O'Flynn sends in a cross, Michael Townsend makes a clearance. 31:10 The ball is sent over by Dominik Werling, clearance made by Billy Jones. 30:49 Dominik Werling takes a inswinging corner from the right by-line to the near post, Troy Archibald-Henville makes a clearance. 30:38 The ball is sent over by Joe Colbeck, blocked by James Dunne. 30:31 A cross is delivered by Ryan Valentine, Troy Archibald-Henville manages to make a clearance. 28:50 Outswinging corner taken by Billy Jones from the left by-line played to the near post, clearance by Sean Canham. 26:38 Unfair challenge on Bertrand Cozic by Tony James results in a free kick. David Noble shoots direct from the free kick, save by Adam Bartlett. 24:20 Guillem Bauza fouled by Troy Archibald-Henville, the ref awards a free kick. James McQuilkin shoots direct from the free kick. 24:20 Booking Troy Archibald-Henville is booked. 21:07 Daniel Nardiello is flagged offside by the assistant referee. Adam Bartlett restarts play with the free kick. 20:17 Guillem Bauza gives away a free kick for an unfair challenge on Richard Duffy. Richard Duffy restarts play with the free kick. 19:01 Corner taken by Dominik Werling, clearance made by Troy Archibald-Henville. 18:49 Joe Colbeck crosses the ball, Billy Jones manages to make a clearance. 18:25 David Noble fouled by Richard Rose, the ref awards a free kick. Direct free kick taken by James Dunne. 16:57 Billy Jones produces a cross, Tony James makes a clearance. 16:29 David Noble fouled by Guillem Bauza, the ref awards a free kick. Direct free kick taken by Billy Jones. 14:37 The official flags Daniel Nardiello offside. Adam Bartlett takes the free kick. 13:39 James McQuilkin is penalised for a handball. The free kick is swung in left-footed by Billy Jones. 12:58 Corner taken by Billy Jones played to the near post, clearance by Ryan Green. 11:58 Unfair challenge on Dominik Werling by Bertrand Cozic results in a free kick. James McQuilkin crosses the ball in from the free kick, clearance by Jake Thomson. 11:29 Daniel Nardiello fouled by Michael Townsend, the ref awards a Penalty. 11:29 GOAL - Daniel Nardiello:Hereford 0 - 1 Exeter Daniel Nardiello scores a penalty. Hereford 0-1 Exeter. 8:51 The offside flag is raised against Daniel Nardiello. Direct free kick taken by Adam Bartlett. 8:33 Ryan Green produces a cross, save made by Artur Krysiak. 7:32 The ball is sent over by Jake Thomson, save by Adam Bartlett. 6:25 Guillem Bauza delivers the ball, Unfair challenge on Joe Heath by Joe Colbeck results in a free kick. Artur Krysiak takes the direct free kick. 4:59 Jake Thomson sends in a cross. 4:26 The assistant referee signals for offside against Daniel Nardiello. Free kick taken by Adam Bartlett. 2:37 Dominik Werling delivers the ball. 1:51 Richard Duffy crosses the ball. 1:40 The ball is sent over by Jake Thomson, clearance by Tony James. 0:12 Ryan Green crosses the ball.